A farmer's daughter found an unlikely best friend in one of her father's cows — and now she's given her the home she deserves. 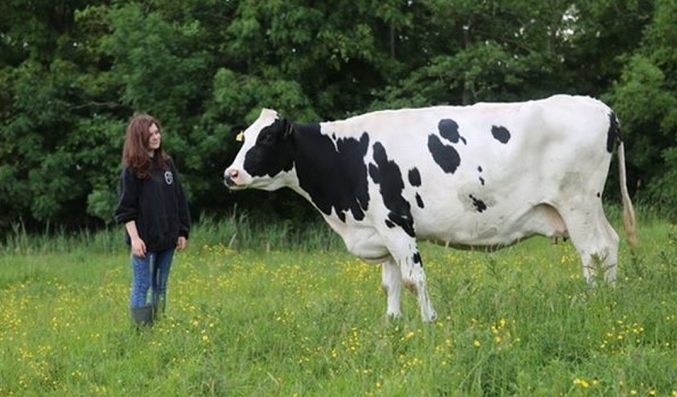 Ellena the cow was born in 2008, when the girl was 8 years old. The farmer's daughter, whose name has not been released, began to spend time with the young calf, and the two youngsters quickly formed a special bond. "We went on lots of walks together and got really close," the girl says in a video of Ellena's recent rescue. "We did all sorts of things together and even walked through the woods." "She was little and I was little," she added. "And that's how we became friends." The pair happily grew up together, but disaster struck in 2011 after Ellena had given birth to her second calf. "I got a call from my dad that I have to come see her, because we have to put her to sleep," the girl says, tearing up. Ellena had suffered an abomasal displacement, which happens when a cow's "main" stomach is pushed out of its normal position. She suffered complications, and the vet said she had a 1 percent chance of survival. The girl went to see her to say goodbye. But it seems her love for the cow sparked a miracle. Despite Ellie's severe stomach issues, she began to eat again once she saw her friend. The family held off on euthanasia, and sure enough Ellie continued to recover — with the farmer's daughter by her side. "I didn't go to school for two days," the girl says. "But she made it." Responses to "Almost Dead Cow Makes a Miraculous Recovery When She Sees Her Human"
Real love can do anything it seems. It is heartbreaking what man does to nature's critters. Love heals all, Only wish there were more like us. ALL cows and all animals deserve better! Vegan! !